The premise of P2P lending is that it matches borrowers and lenders directly, while removing the need for a bank intermediary. In traditional banking, lenders loan money to banks in the form of low interest bearing savings deposits or CDs. Borrowers then apply for loans from banks. In P2P lending, the middle man is replaced with a central exchange platform where borrowers provide their loan specifics and credit info, and lenders specifically choosing who they want to extend their funds to. By operating only as an exchange and not handling both sides of the loan like banks, P2P lending firms have been able to offer reduced fees to users of their system. While still a fraction of the overall consumer lending market, P2P lending has been quickly gaining traction in 2014, with representatives of banks and VCs both explaining to Forex Magnates that it is a key fintech sector that they are evaluating in relation to investing in, or launching competing products. In its infancy in the mid-2000’s, P2P lending started as a method of providing lending to the unbanked or to individuals with credit issues in the past which caused them to be denied by banks. However, since then it has expanded to traditional consumer banking customers who view the product as a method to achieve higher rates of return on their funds as well as reduced loan rates. 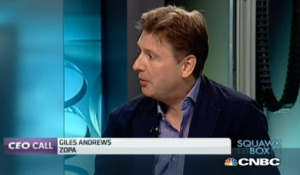 Speaking to CNBC today, Giles Andrews, CEO of Zopa, explained that their borrowers are primarily consumers who could get a loan from a bank, but “come to us because we offer better value and better customer service.” Andrews added that in comparison to banks, Zopa is more efficient, which leads them to having lower margin and better rates for their borrowers and lenders. According to Andrews, loans range from the mid-4% level to the teens, with averages in the 5% area. In the company’s public release regarding the $1 billion milestone, Zopa stated that it has 57,000 active lenders on its system, receiving average interest rate payments “double the rate of inflation and five times higher than some rates offered by high street banks and building societies.” According to Zopa, its average lender is a 47 years old who has lent £5,710. Hitting the $1 billion milestone, Zopa stated that it has approved over 104,000 loans, with the platform currently sporting 63,000 active borrowers in the UK with an average borrowing size of £5,500. Car loans represent the largest segment of borrowing at 40%, followed by home improvements and debt consolidation at 20%.